Full-size in beautiful aluminum: Available in Silver and Space Gray, Apple fans now have a full-size Bluetooth keyboard that’s backlit, matches the look of their system, and feels great to type on. 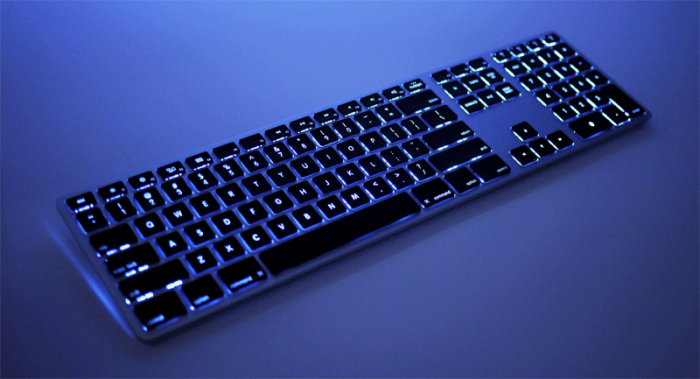 Backlit keyboard. Wireless with a number pad: If you like Apple’s wired keyboard with numeric keypad but wish it were wireless, this is the one to get (especially if you need/want backlighting). Rechargeable 1-year battery life — for Bluetooth: No expense was spared to make this the best Bluetooth keyboard possible. That includes putting a much bigger rechargeable battery in it than we had to — 1,600 mAh. That’s 5x to 12x bigger than what’s inside most other wireless keyboards; big enough to last a year, on a single charge. 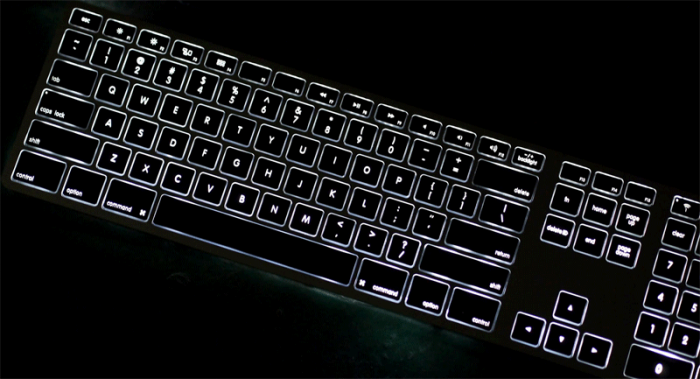 Backlighting done right — 2nd dedicated battery: Most backlit keyboards stop working if you use the backlight too much, running the battery dry quickly — VERY inconvenient. For this reason, we have a 2nd separate rechargeable battery just for the backlight. So, you can use the backlight as much as you like. If the backlight runs dry, the keyboard will still continue working off its own separate battery — for up to a year. The backlight battery should last 1 to 2 weeks between charges, in normal use. Pairs up to 4 Bluetooth devices: Mac, iPad, iPhone, Windows, or Android. 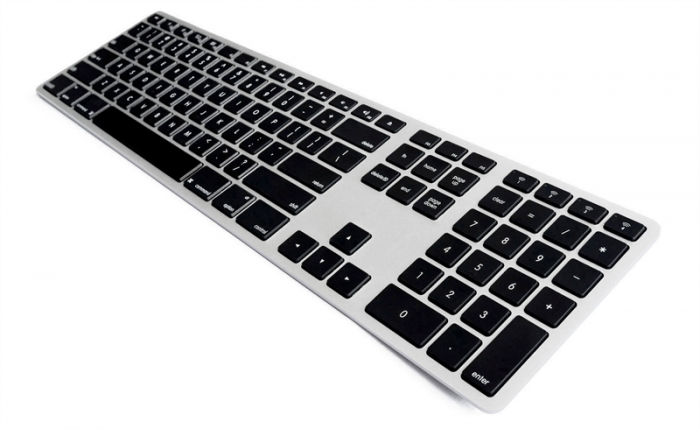 It may look like a Mac keyboard (and it is) but the Matias Wireless Aluminum Keyboard can do a few extra tricks. You can pair up to 4 Bluetooth devices, easily switching between them with the press of a button, and the keyboard adjusts its layout to match each device (as you switch) — whether it’s Mac, iPad, Windows, Android, etc. Mac-friendly function keys: Just like an Apple keyboard, the function keys let you control screen brightness, volume, iTunes, and more. There’s even an Fn key, that lets you momentarily change the function keys back to their traditional duties, when you need them. Stays on. Stays connected: Other wireless keyboards will often power down and disconnect to conserve battery life — leaving you waiting, each time they reconnect. 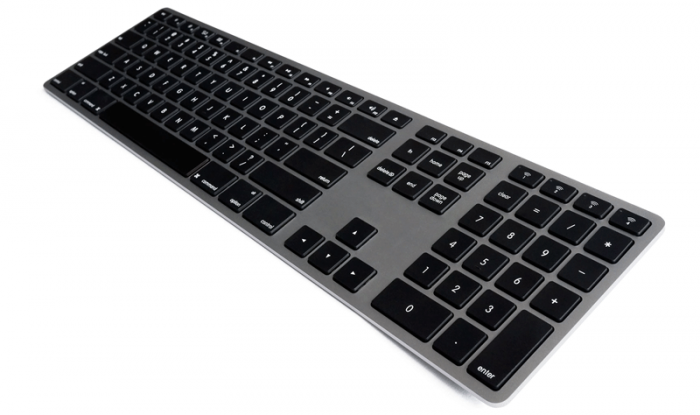 With its BIG battery, the Matias Wireless Aluminum Keyboard doesn’t need to do that. It stays on, and stays connected. These simple luxuries — not having to worry about batteries, no waiting to reconnect — make it feel more like a wired keyboard. Rechargeable Backlight Battery Life: Backlight battery life varies depending on brightness level, typing patterns, rest breaks, etc.